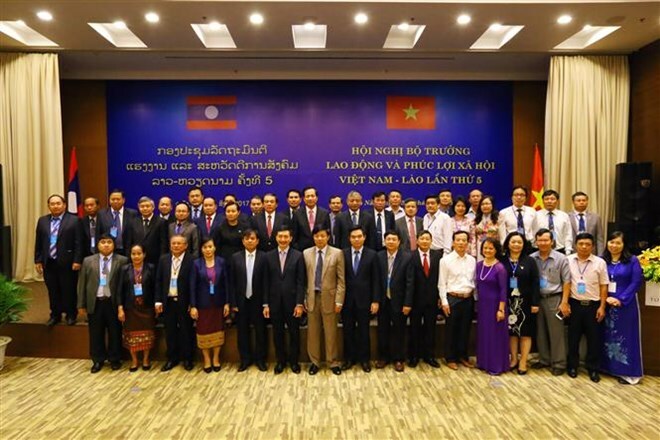 Da Nang (VNA) –The fifth Vietnam-Laos Ministerial Conference on Cooperation in Labour and Social Welfare was held in Vietnam’s central province of Da Nang on August 4. Addressing the event, Vietnamese Minister of Labour, Invalids and Social Affairs Dao Ngoc Dung underscored the pragmatic and effective cooperation between Vietnam and Laos in all fields, including the affiliation between the Ministry of Labour, Invalids and Social Affairs of Vietnam (MoLISA) and the Ministry of Labour and Social Affairs of Laos (MLSA). He appreciated the Lao side’s coordination in accepting Vietnamese labourers to work for projects in Laos as well as the affiliation between the two ministries in opening an orthopaedics and rehabilitation centre in Can village, Vientiane, Laos, in December 2015. Dung also talked about the MoLISA’s scholarships in labour and social welfare for the Lao side, their delegation exchanges, and cooperation in human resources development, especially in border areas. The Vietnamese minister thanked the MLSA and other relevant agencies of Laos for their close coordination in searching remains of Vietnamese volunteer soldiers who sacrificed their lives in Laos, saying he hopes that the two sides will further their cooperation through the exchange of delegations and experience, and personnel training. Dung views were echoed by his Lao counterpart Khampheng Saysompheng, who said that the partnership between the two ministries should be deepened across fields. Under the minutes of the fifth Vietnam-Laos Ministerial Conference on Cooperation in Labour and Social Welfare, the two sides agreed to accelerate the implementation of the Vietnam-Laos labour cooperation agreement inked in 2013. They will also coordinate with the two countries’ defence ministries and concerned agencies to repatriate the remains of Vietnamese volunteer soldiers and experts as well as Lao soldiers who died during the war in Vietnam. At the same times, the two sides will intensify experience sharing and continue their cooperation in personnel training.